Do you feel transported when you are immersed in nature, free to float above your troubles and yet simultaneously grounded? It’s not surprising then that painting directly in the landscape can be intoxicating. The vitality of nature, the essence and atmosphere of a place, work their magic on my creative spirit. 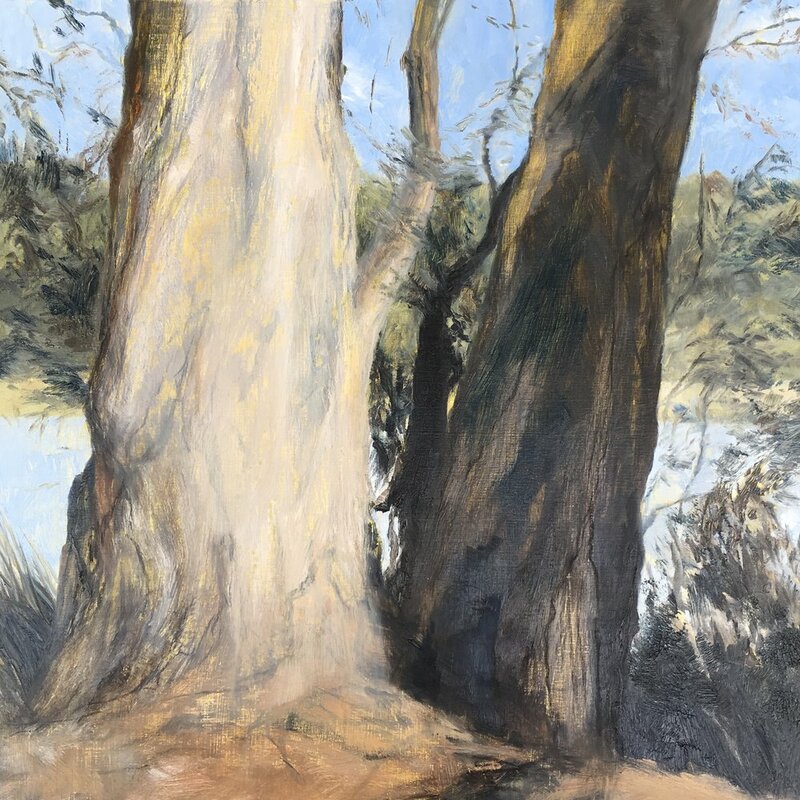 Painting ‘en plein air’ has long been a vital practice of landscape artists - think of Monet, Renoir, Streeton, Tom Roberts and Fred Williams… not to mention contemporaries such as Elizabeth Cummings and John Olsen. The tranquility and beauty of Glenbrook Lagoon has captivated my heart and is inspiring me to paint and draw. I am fascinated by the stillness that pervades the lagoon, despite it being a thriving ecosystem, echoing with bird song, frog chirruping and the rustling of leaves and reeds. Working en plein air demands that I respond immediately to the texture and feel of the place. My paintings visually ‘map’ various perspectives of the lagoon, as though made while attentively walking the 1.5km circuit track. The enormous eucalypts that grow along Glenbrook Road stand like timeless sentinels, guarding the glimmering water beyond. The silvery reeds stand and lean in elegant masses along the shoreline, providing sanctuary for many small creatures. I’d love you to join me at the lagoon to learn to paint confidently outdoors! My last workshop for the year is happening next month, 24 & 25 November. ‘Capturing the Spirit of Place’ will be a wonderful opportunity for you to learn new skills, meet like-minded people and have fun. Not only that, you get to enjoy my wholesome and delicious food! So, don't hesitate - book now! Saturday 24 and Sunday 25 November, 9.30am - 4.30pm.